Back when I started this Bumbling Gardener adventure, one of my early posts inspired another fledgling gardener to start her own garden. And I’m happy to report, she’s come along way, baby! What was once an uninhabitable empty plot full of small stones — even weeds wouldn’t grow there — has become a thriving garden. In the back there are a couple of kinds of corn, onions, lettuce, and spinach, as well as edemame, celery, broccoli, strawberries and an assortment of herbs. In the front, a multitude of raspberry plants (enough to make the Scientist jealous) are interspersed with beans and peas. Reva reports that the kids have gotten very engaged in the process, which has been a wonderful and unexpected bonus to the whole adventure. 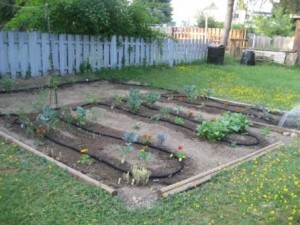 This entry was posted in Bumbling Gardener, Urban Gardening and tagged City Farmer, urban garden on June 20, 2009 by local delicious. One of the very first things to sprout in the new garden, despite — or maybe because of — my planting them in mid-April, were the radishes. When I arrived at the garden in the middle of last week I discovered that the radishes were not only growing like crazy, they were getting ready to seed. I quickly trimmed off all of the large stalks to ensure that doesn’t happen. I’ve never seen radish greens get so large. Is this normal? I pulled one of the larger, white radishes and took a bite. Wow, that thing has zip! I didn’t think it was going to be a horseradish, people! I think I’ll wait a few weeks to see if they get red. 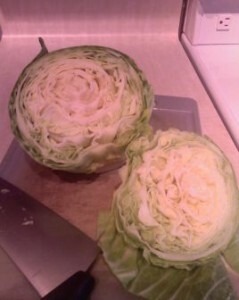 Either way, they’ll make a nice shredded addition to salads and/or my next stir fry. 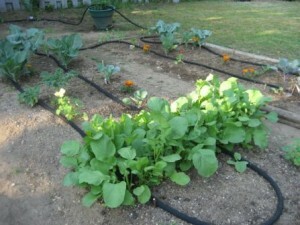 This entry was posted in Bumbling Gardener, Urban Gardening and tagged urban garden on June 8, 2009 by local delicious. 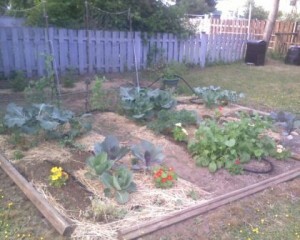 In the ongoing adventures of the Bumbling Gardener, I’ve been planting a bit here and there each week. 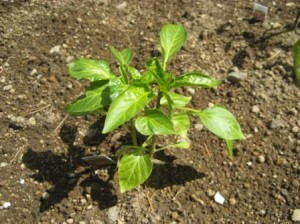 First it was the early nursery transplants — so far only one loss, a golden bell pepper plant. The other one is absolutely thriving. Then it was seeding into the ground with a couple of different kinds of radishes, some beets, spinach, two types of lettuce, a couple of carrots, parsnips, herbs, etc. Oh, and some yellow and green onions. When I didn’t have much success with seeding the inoculated beans and peas (they rotted in their peat pucks), I tried seeding some non-inoculated ones. 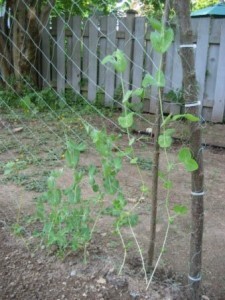 The beans weren’t so keen to play, but the peas were pretty happy to sprout for me. Some of those worked, fewer yet survived my care and a couple are now transplanted into the garden. 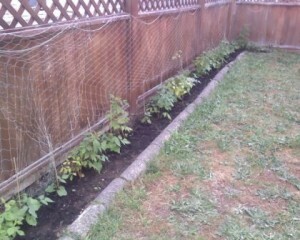 I’m hoping it’s warm enough that there won’t be a repeat of the last seedling transplant debacle. I did see a squash sprouting in the garden all on it’s own, the other day. I guess there were two seeds in one of the peat pucks. The first one died of frostbite and the second one is now checking things out. Maybe it’s an acclimatization thing. 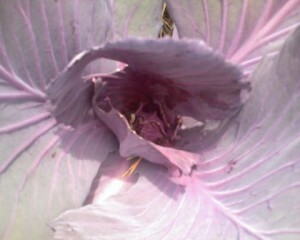 I’m sending it many happy, growing thoughts. 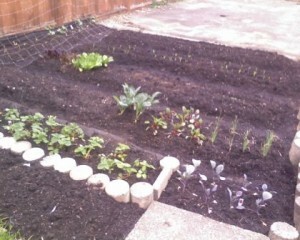 After many weeks of putting things in the ground, we now have a variety of green bits poking out of the ground. It’s very exciting! Thank heavens for the name sticks and my hand drawn map of the garden, or I’d have no clue what I was seeing. 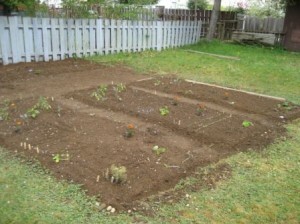 This entry was posted in Bumbling Gardener, Urban Gardening and tagged garden, urban garden on May 24, 2009 by local delicious. Step I of the Seedling Saga is complete and Step II is underway — the little blighters (hmmm, maybe that’s not a good thing to say of seedlings) have moved on to bigger and better accommodations in mini plant pots of their own. They started in peat pucks and those that have showed some sign of living up to their potential have graduated to small, individual pots. That’s Step II. Near the beginning of my experiment, I was gifted with a huge, dusty, abandoned apple box FULL of mini starter pots when The Scientist spotted and salvaged them, thinking I might have a use for them. 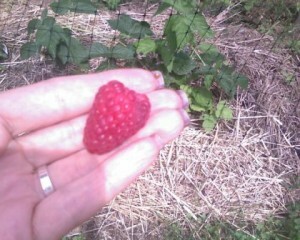 How serendipitous! They sure came in handy when it was time for my seedlings to move out of community housing. I haven’t used nearly a fraction of them, so I’ve passed a few on to a fellow urban gardener-in-the-making. Some seeds will sprout, some will not. Ours is not to know the reasons why. Some sprouts will thrive in their new individual lodgings, some need more time in the mini greenhouse with their friends, in order to thrive. 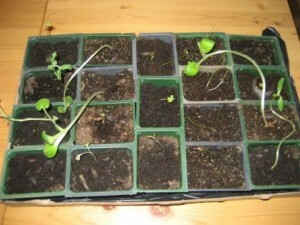 No matter how sturdy those zucchini sprouts look, one clumsy, misplaced movement and they’ll snap. Zucchini are impressive sprouters, acorn squash not as much, spaghetti squash wholly unimpressed with the housing and not cooperating. Ignore the “rules” to clip the weaker of the sprouts and keep only one per peat puck — who’s to say in the early days if you clipped the right one. Keep them all until they are sturdy enough to trade up. 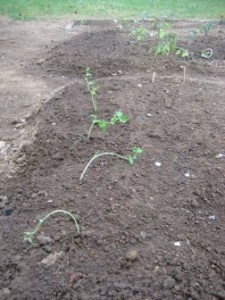 This entry was posted in Bumbling Gardener, Urban Gardening and tagged seedlings, urban garden on May 11, 2009 by local delicious.